For Easter I was in charge of making desserts. One of the desserts I made was an icebox cake. An icebox cake is basically a layered dessert with cookies or crackers. By putting it in the icebox (i.e fridge) for a few hours, the cookies will absorb moisture from the surrounding ingredients and become soft and cake-like. This seemed like an easy recipe to try, especially since I also made puff pastry from scratch that same week. I used a 9 x 9 glass pan. I kept the ingredients approximate since your pan size may vary. First put a thin layer, ~ 1/2 inch, of whipped cream on the bottom of the pan. Next, put a layer if the graham crackers. Repeat with another layer of whipped cream. Next, put a layer of strawberries. Drizzle with white and milk chocolate. Add another layer of whipped topping, then graham crackers, then strawberries and chocolate drizzle. I was able to get three layers in, but it was heaping. You may only get 2 depending on how deep your dish is and how thick the whipped cream layers are. Place in fridge for ~ 3 hours. Notes: I made this the day before Easter, so you can definitely make it ahead of time. I also chose to not sweeten the cream I used. 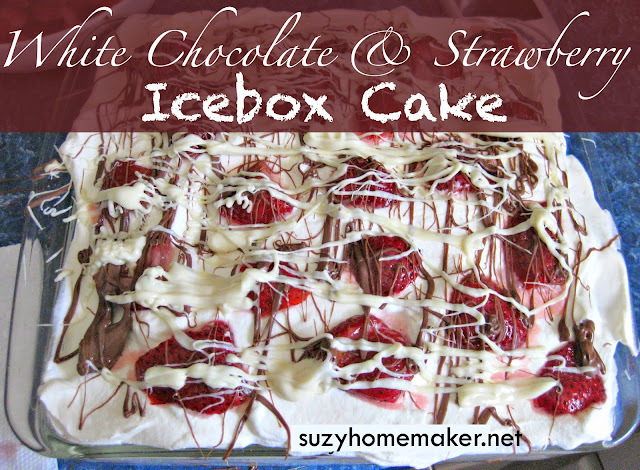 There is plenty of sweetness with the strawberries and drizzled chocolate. Also not sweetening the cream kept it a nice and light dessert - perfect for summer.